I just arrived home from Mass. It’s so chilly this morning that there is an ethereal fog rising up from the river. Everything is soft edged. I’ve reheated a last cup of coffee and it tastes wonderful. Max and I are soon to head out to Frank’s Flats. 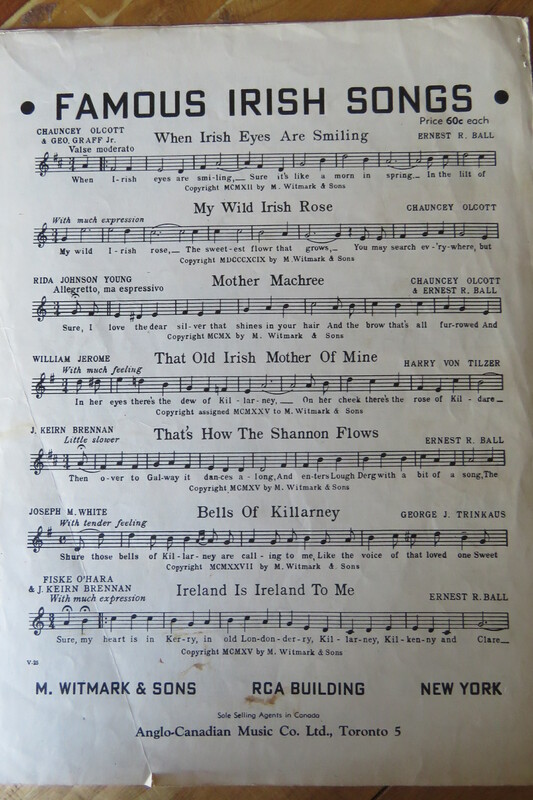 The next piece of sheet music in Dad’s collection is Too-Ra-Loo-Ra-Loo-Ral (That’s an Irish Lullaby) by James Royce Shannon and it’s caused me a bit of tear as I listen to the Irish Tenors deliver it. 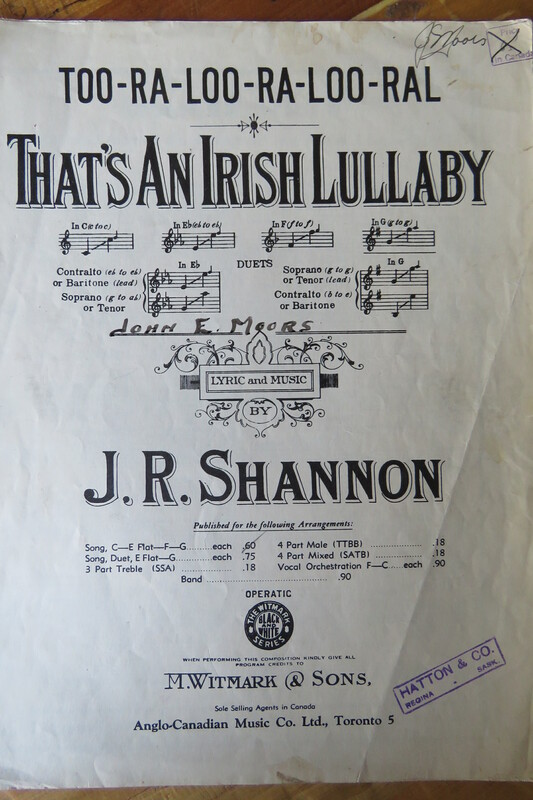 The lyrics to Too Ra Loo Ra Loo Ral were written in 1913 by James Royce Shannon (1881-1946). It premiered in Chauncey Olcott’s production of Shameen Dhu (Black-haired Jimmy). 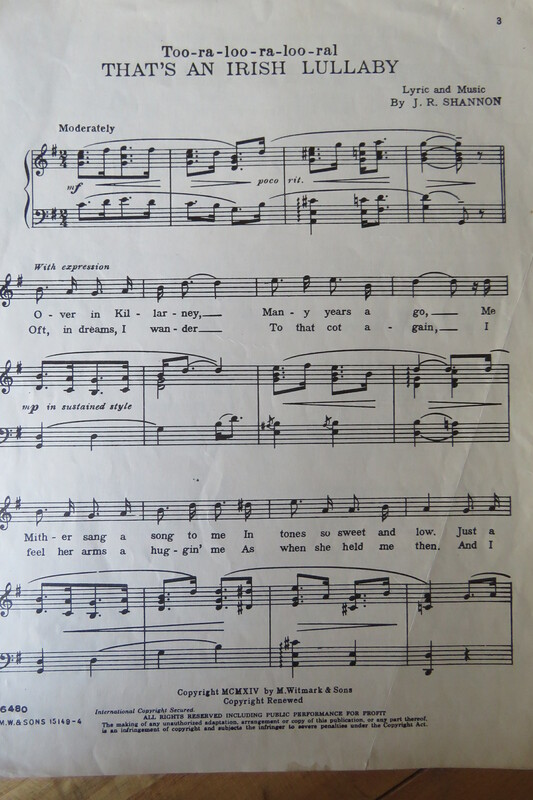 The song later became a hit for Bing Crosby who sang it in Going My Way (1944). Chauncey Olcott was born in Buffalo, New York. He produced several shows about Ireland for the New York stage. I’m guessing that Dad sang this along with other Irish tunes on the radio station in Moose Jaw. I’ll have to ask him. Hearing it brings memories of my Gramma Moors who comes from the Irish Elliotts. I’m raising this one up for her this morning. I’m wishing you all a beautiful day of sunshine and blessing. 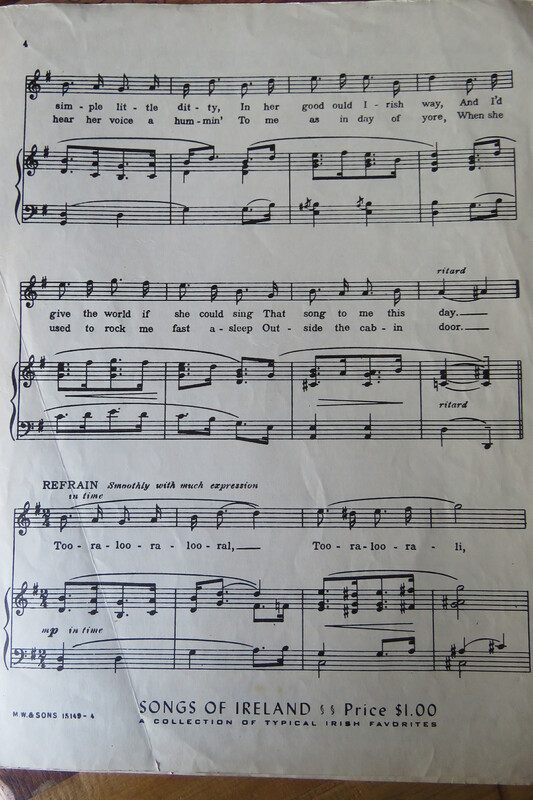 These are the original lyrics of the song as published in 1913 by Shannon through M. Witmark & Sons. And I’d give the world if she could sing That song to me this day. Hush now don’t you cry! I feel her arms a huggin’ me As when she held me then. When she used to rock me fast asleep Outside the cabin door. 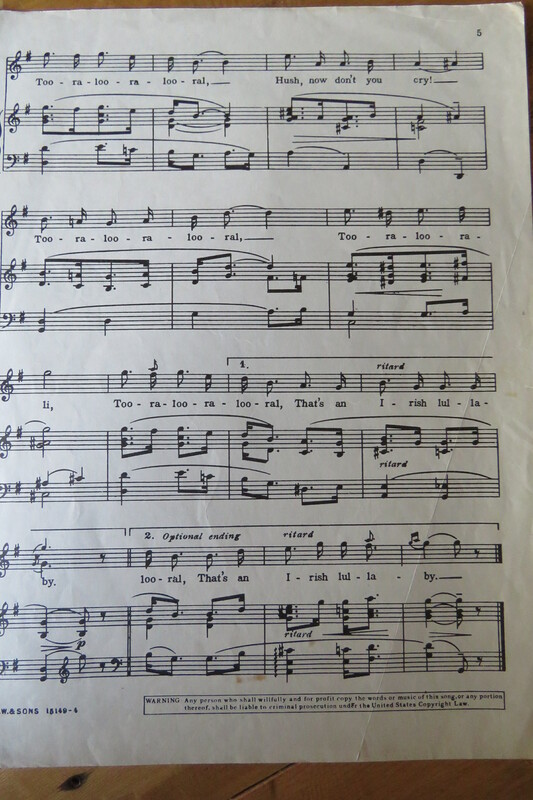 Bing Crosby also delivered this one…his voice is so warm and nostalgic.